Forest where people of Dani live is rich of endemic flora and fauna like bird of paradise (cendrawasih), popinjay, various types of insect and colorful butterfly with various colours and patterns. For the culture, althought people of Dani are christians, many of their rituals still use old culture which is inherited by their ancestors. They believe about Rekwasi. All of religious ceremonies is accompanied by songs, dances, and offerings to their ancestors. War and hostility usually happen because of the problem of border, women, and theft. In the "rekwasi", the soldiers usually will make "tanfa" with lard, clams, feathers, cuscus, sago, mango tree sap, and flowers in their body parts. Their hands hold typical traditional weapons from Dani tribe like spear, axe, chooper, bow and its arrow. One of another unique habit from Dani itself are the habit of listening to heroic songs or sad stories to inspire and encourage the people and also as a barrier of time when they work. For the musical instruments that accompany the songs usually use "pikon" , a musical instrument that is placed between their nose hole and their ears hole. Beside as the song accompanist, "pikon" also has double function as a cue to their friends or enemies when they hunt in the forest. Name of "Dani" itself actually means "foreigner", it comes from "Ndani" word, but there's a phoneme change so phoneme "N" was deleted and becomes "Dani" only. Dani tribe actually prefer called as Parim tribe. 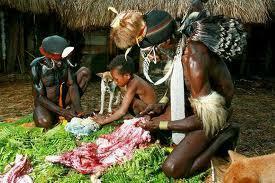 Dani are very respect to their ancestors and they usually do the ceremony of pig party as a form of the homage. In all probability, in that time, the people was still in pre-agrarian step where they were just beginning to plant the productive plants in limited number. Inovation that runs continuously and culture contact between the tribes causing simple planting patterns develop into a plantation system of sweet potato, like today. The main livelihood of Dani are farming and raising pigs. Sweet potato is kind of main plant to be cultivated, and it's mean that their livelihood in general is farming. As a form of homage to their ancestors, Dani make a symbol for their ancestors called Kaneka. In addition to the symbolism to their ancestors, also known "Kaneka Hagasir", a religious ceremony which aims to the family prosperity, also it is held to start and end the war. Dani has 3 systems of kinship which consist of kinship group, Paroh communities, and territorial group. The smallest kinship group of Dani is spacious family. The spacious family itself consist of 2 or 3 main families that live together in a big house with bulkhead like fences, called Slimo. In a village in Dani tribe there are 4 until 5 slimos with 8 until 10 families that inhabit the house. The marriage system of Dani are poligamy and polygyny. According to mythology, Dani come from the descent of a married couple that inhabit a lake around Maina village in south Baliem valley. Community structure of Dani like Paroh communities is combination from several small clans called "ukul" and large clans called "oak". The half communities has typical characteristic such as a group community of this kinship is a half of whole society in particular area. The function of this kinship system is similar to kinship system of Fratri. However, the half communities still has important function like political function to keep the balance between the ruling power and the society itself. It's mean that people who have the power in the society can't act arbitrary. The art of Dani can be seen from the way they build house as mentioned above, in a slimo there're several buildings such as : Honai, Ebai, and Wamai. In addition to build house, people of Dani also has typical handicraft like woven net bag that is used for headgear and binder ax. People of Dani also has several tools which is made from bricks. The tools are : Moliage, Valuk, Sege, Wim, and Kurok.